Back in the booth for Back to Earth. 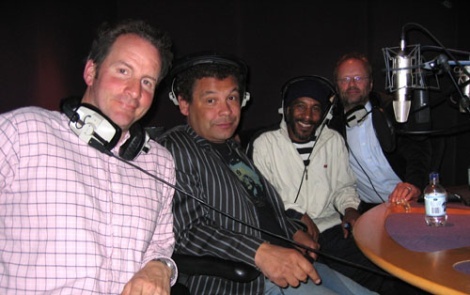 On April 25th the Red Dwarf cast - Chris Barrie, Craig Charles, Danny John-Jules and Robert Llewellyn - were reunited for the first time since shooting Back to Earth to record their DVD commentary. Amid much discussion on the show's remarkable reception - both among fans and with the 3-million-plus ratings - the guys found it easy to recall the events that surrounded filming. This is, after all, the first commentary recorded within months of shooting, and chatting over the episodes was a breeze. Earlier that day Doug Naylor had settled in with a strong coffee and a handy set of notes to record his own comprehensive and anecdotal commentary, discussing the various aspects of production and picking up on parts of the programme that have changed for his feature-length edition. The big surprise with the Director's Cut is that it's actually slightly shorter than the broadcast original. It's closer to the version shown at the celebrity premiere, with trims made to the first act that couldn't be made to the broadcast 'Episode One' due to running time restrictions for the minimum length of a show. The odd shot has also been dropped in or subtly reworked. You'll be able to compare and contrast the two cuts, and endlessly debate their differences, when the DVD comes out. Both broadcast and director's cut versions will be present on the disc - with cast commentary available on the former, and the director's on the latter. Back to Earth is available to pre-order all over the damn place - including Amazon, Play, HMV	and the BBC Shop.